These items are custom made and can take up to 2 weeks to ship. The lunch boxes are made of .30 millimeter tin (lead free) and covered with printed, laminated high-tack adhesive on all sides. They have a chalkboard on the inside lid for writing notes to your loved ones. Finished size is 7-5/8" x 6-3/4" x 4". Will ship in approx 2 weeks. Shipping cost is $9.75. 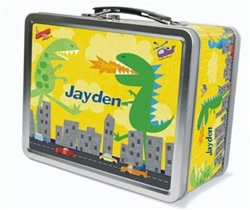 These cool dinosaur lunch boxes for boys are made of .30 millimeter tin (lead free) and covered with printed, laminated high-tack adhesive on all sides. They have a chalkboard on the inside lid for writing notes to your loved ones. Finished size is 7-5/8" x 6-3/4" x 4". Will ship in approx 2 weeks. Shipping cost is $9.75. I know my product did not come when it was schedule but I appreciated you guys for calling me inreference to my product. I will continue ordering from your site I know things happen and I thank you guys for keeping me informed.